Can Singaporeans live without maids? Hands up if you’ve got a domestic maid at home. Chances are, almost 2 out of 10 households in Singapore use a domestic helper. And that probability may be higher if you’ve got young children or aged parents at home. If the new policies from the Philippines and Indonesia kick in that may cause some Singaporeans to drop the idea of hiring a domestic helper, can we survive on our own? Recently, there were already reports that Indonesian helpers employed in Malaysia can only do limited set of tasks, only housekeeping, babysitting or caring for the aged but not all 3. While I understand the concerns that these helpers may be overworked by some employers but with such a limited responsibilities, the help rendered may well be handled by ourselves. In other countries, like Japan, South Korean and even the US, the concept of a live-in helper is simply unheard of due to the high cost. But somehow, they have managed to get by. So are Singaporeans a pampered bunch? We made a decision right from the start to go maidless. And yes, we are still surviving, thank you. My daughter was placed in a infant care centre when she turned 4 months after my maternity leave. It was just across my office so it was convenient to drop her off and pick her up. We’re still on the same arrangement with her in another child care, which I really give the thumbs up. One thing that we really appreciate is that the child care center understands the needs of working parents and serves dinner in school. Plus they even extended the center closing timing to 7:30pm, which is a great help if we do get held back at work. You know wives who complain that they have to wash the dishes right after their husband did them? Not for me, because Alexis does such a wonderful job. In fact, he takes care of most of the cleaning and he’s a lean mean cleaning machine. We are very democratic when it comes to the household chores. Since we dont’t have a maid, everyone must chip in. That includes Sophie. She’s been taught to keep her things away after she’s done, bring her used utensils to the kitchen and even helps me with the laundry. I’ll say, it’s a fantastic way to teach the little ones about responsibilities around the house. With Sophie’s dinner being settled in child care before coming home, it takes a huge load off me. But because I’ve decided to embark on a healthy lifestyle, I decided to prepare own my meals so that I have control over what I eat. When cooking, I opt for simple dishes that I can whip up in less than half an hour. This would mean that I would need to prepare some of my ingredients the night before so that I can just concentrate on cooking when I get back. Some days, I would even cook extra portions so that I can have left overs to freeze, either for another day’s lunch or dinner. I hope to learn more recipes with my newly acquired “toy”, the Happy Call Pan, which I can whip up in the kitchen. I’ll be the first to admit that I’m no superwoman despite me working, cooking, cleaning and looking after my family. The decision to go maidless would not be possible if not for the support from a very hands-on husband who not only helps with the household chores but also with Sophie. Otherwise, how else can I find the time to cook or exercise? We’ve also got very supportive parents who help us out on the home front whenever they can. They’ll even gladly pick may daughter from child care on evenings when we have a date night. And not forgetting, understanding bosses and colleagues who understands that our families need us after a day’s work. If you have a maid at home, can you foresee yourself without help in the family? Or perhaps you’re also maidless, in that case how do you cope? I’ll love to hear your personal experiences. Susan is a full time working mother of one and writes at A Juggling Mom, as she juggles between the many roles of being a mom, wife, daughter, girl friend and career woman on a daily basis. She hopes to share parenting resources that can help moms to find work life balance in their lives. Next articlePrevent Myopia with 3M Polarizing Light! 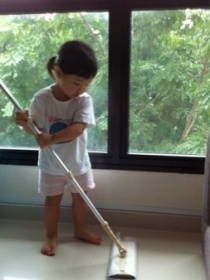 One 1 kid don’t need maid sure can handle. If you have more young kids how u handle without maid while u r FTWM? For me I have 3 kids in the child care. After they finish school and during weekends, most of the time I handle them on my own as hubby is usually out in the evenings and weekends. I think it is manageable as long as there’s a routine and system in place. This is also the reason why I choose to have a career working from home as my time is more flexible and I don’t get so tired travelling to and from work everyday. I do agree SOME Singaporeans are quite dependent on maids. Few of my fruends hire a maid though their only child is in childcare which i feel is unnecessary. Another alternative is to send your child to child care/ infantcare n I don’t think a maid is needed in this case.